Book now for the Art of Healthcare in Salford and Manchester, a series of events and workshops open to everyone and available for free to healthcare professionals. 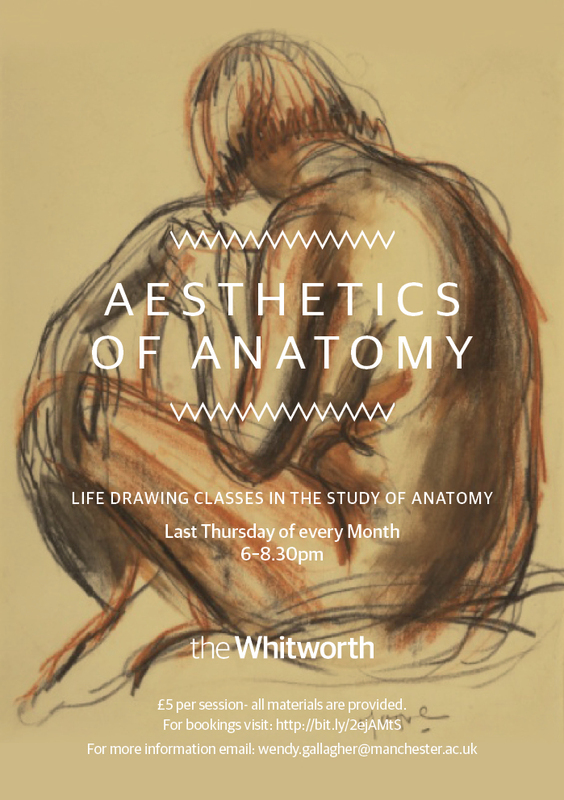 The programme offers the opportunity to develop or refresh skills that are directly applicable to clinical practice, and to be part of a conversation about how the arts can contribute to good healthcare. Join us for a workshop on Leadership & Teamwork, or a practical session on photography and medicine. 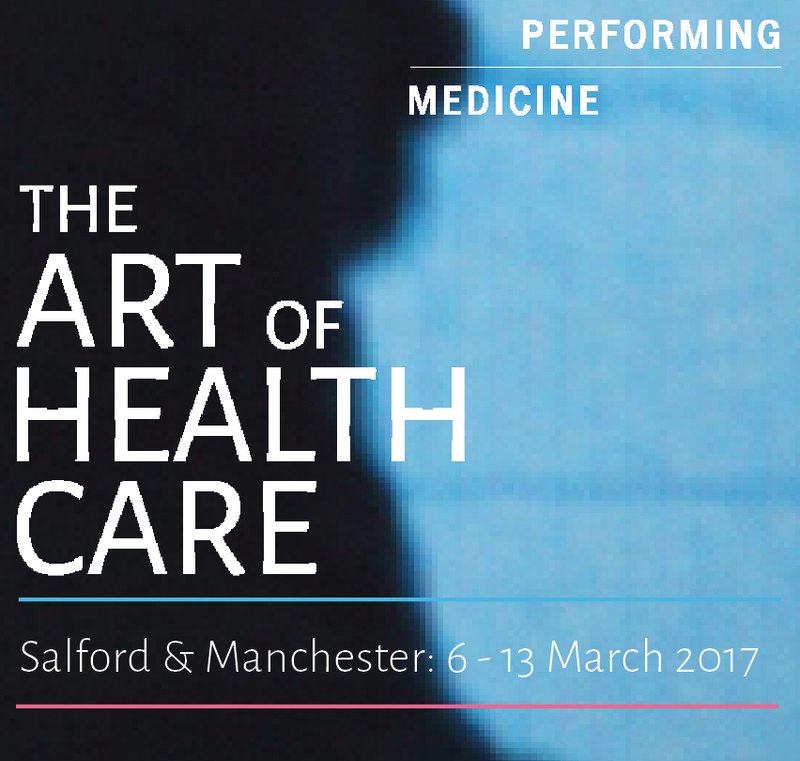 Art of Healthcare will be presented for the first time in Salford & Manchester, delivered in partnership with The Lowry, Salford Royal NHS Foundation Trust, the Doubleday Centre for Patient Experience at The University of Manchester, and the Whitworth. Next in our series introducing creative portfolios is Gemma Wilson, who graduated from the MSc in Medical Humanities in 2015. She is now a Lecturer in the School of Community Health and Midwifery at UCLan. 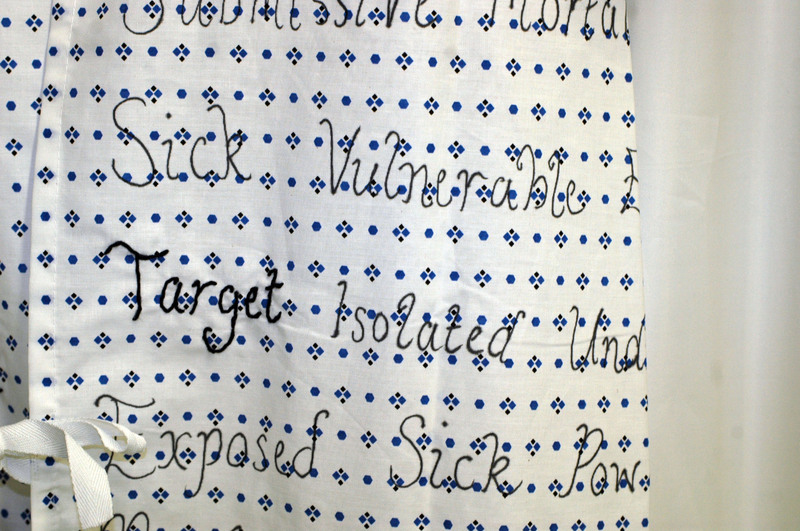 This piece was inspired by an article entitled ‘White Coat, Patient Gown‘ (Wellbery and Chan, 2014), which discusses the fact that although a lot of attention has been paid to the symbolic power of the doctor’s white coat, very little has been written about the patient gown. 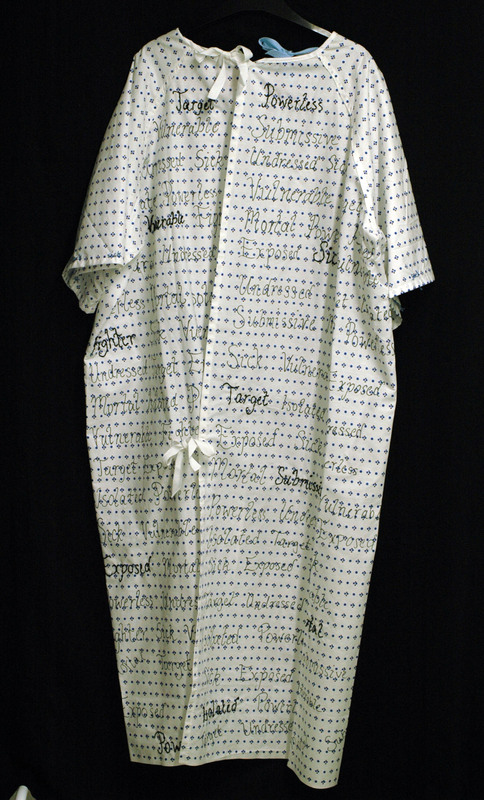 Prior to this, I hadn’t given much thought to the gown, although it is something I had come across every day when practising as a midwife. I began to consider the act of putting on the gown and becoming a patient, and the impact that might have on an individual. 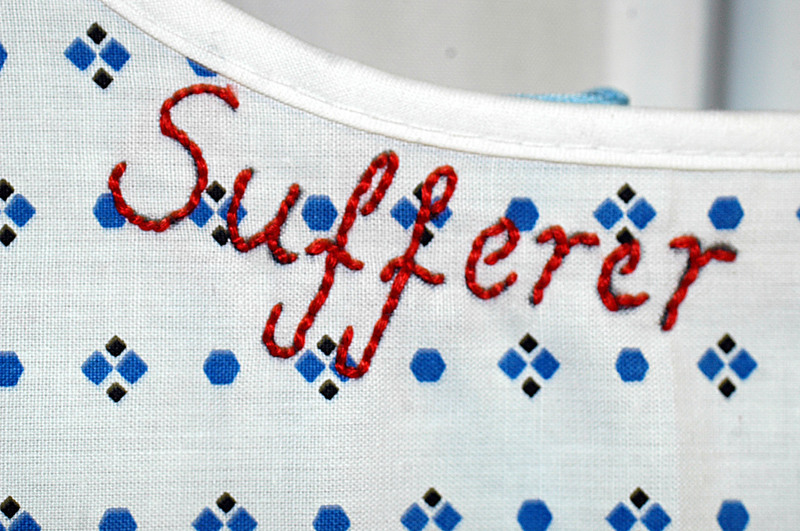 I started to think about the words we associate with being a patient and decided to embroider them onto a hospital gown. I was interested in making those unspoken assumptions, ideas and beliefs visible. 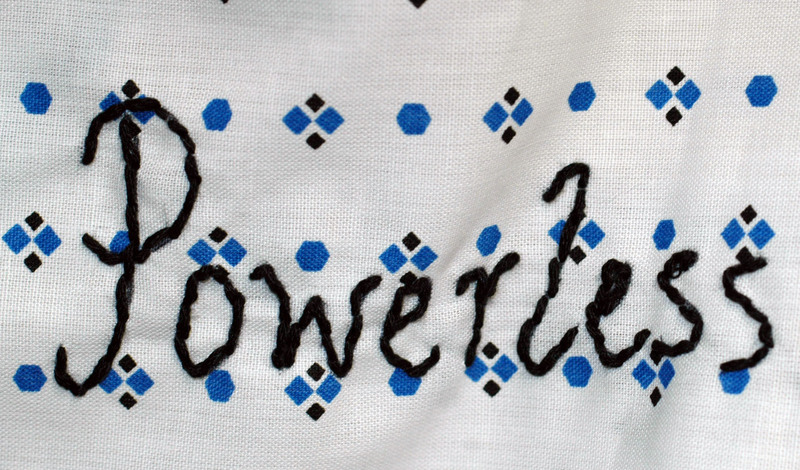 Overall, the process made me more aware of what we take for granted in terms of the power structures within health care and how these are reinforced. 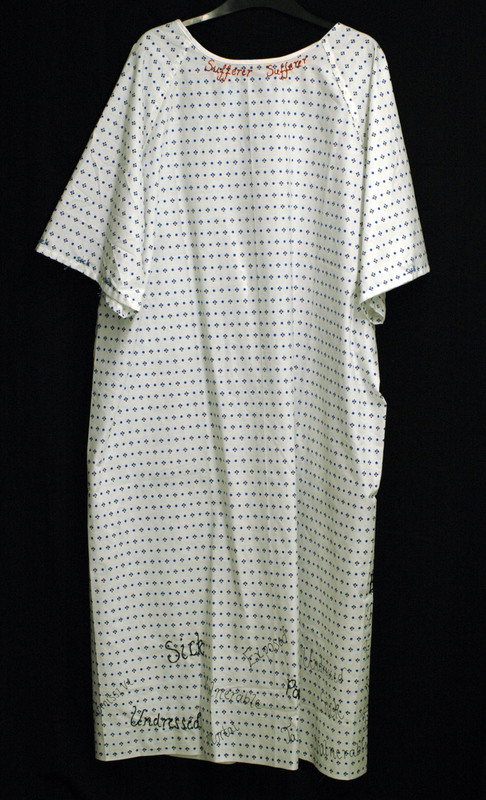 When a person wears a hospital gown, it transforms them from an individual (with specific needs, ideas, beliefs and wants) to the role of a patient whose identity and needs become determined by medical criteria. I wrote this journal entry after a visit to the Manchester Museum, where I encountered an exhibit displaying the skeleton of an unknown woman next to the skeletons of apes and prehistoric humans. I found this both disturbing and baffling. Disturbing, as I hold the belief that human remains should be treated with respect – something that has been taught and reinforced to me through the values within our society. It was baffling to me that the woman’s remains could be treated as an object for education and entertainment, because her identity was unknown; whereas, if she had an identity – and possibly living ancestors – this would be completely objectionable. I couldn’t reconcile the reasoning or logic behind this, and it left me feeling quite angry and frustrated. I imagined my own skeleton in the museum years into the future – my experiences, successes, failures, triumphs and tragedies all forgotten and unknown to the strangers who peer at my bones from the other side of the glass. This experience taught me that we can think that we have fairly strong shared beliefs that link us as a society or a profession, but when we start to look closer at things, we see inconsistencies all around us. I wrote this story after a Medical Humanities session with a doctor who was discussing ‘heart-sink patients’. As soon as these patients step through the clinic door, the doctor’s heart will sink, because they are ‘difficult’ in some way. 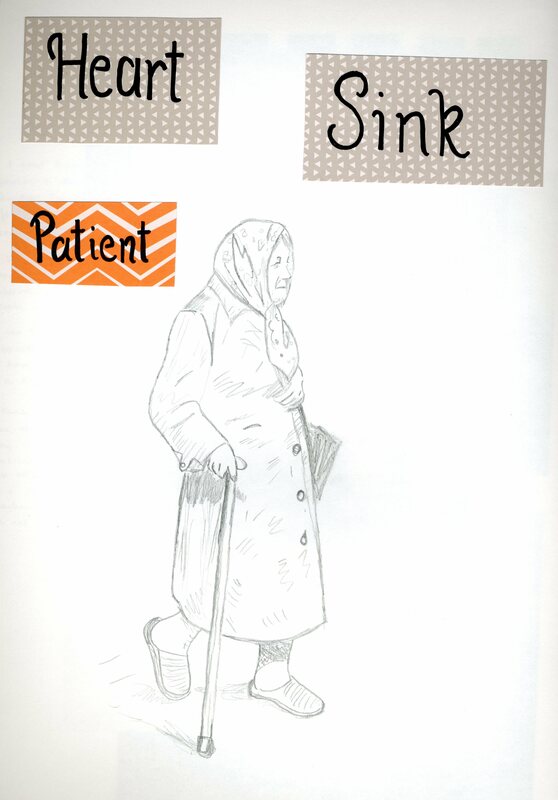 I began to think of the experiences of an elderly relative of mine who had an unshakeable trust in medicine. She truly believed that doctors could work miracles to the extent that she would regularly make trips to the GP to see if they could cure her old age. When they told her there still was nothing they could do, her heart would sink, but she never gave up, and every month or so she would return to see if there was a new medicine or treatment that would help reverse the effects of time. This inspired me to write a story around the idea of a ‘heart-sink doctor’: about a retired woman and her complex relationship with both medicine and her family. I found that creative writing was a really effective way of exploring complex and interlinked ideas within a short space of time. 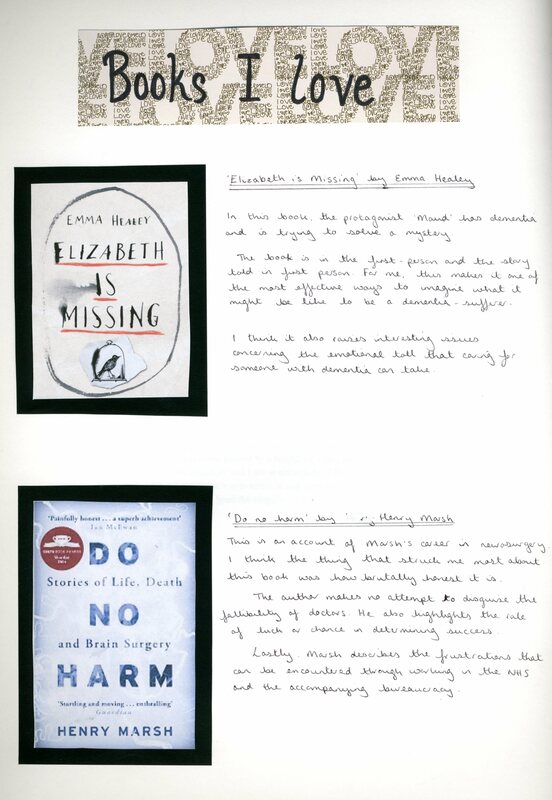 A journal entry about books Gemma read for leisure as she was studying medical humanities – but which influenced her thinking around health, wellbeing and medicine. Prior to the completion of this creative journal, I hadn’t done anything creative like this; however, I found this to be one of the most rewarding and important learning experiences I’ve had. It pushed me to move out of my comfort zone and to think of new ways of approaching, understanding and presenting a variety of content. The freedom we were given to explore our own ideas also meant that we had the opportunity to discover our passions and interests within medical humanities, which was so useful later in the course (and beyond). All artwork and images © Gemma Wilson. 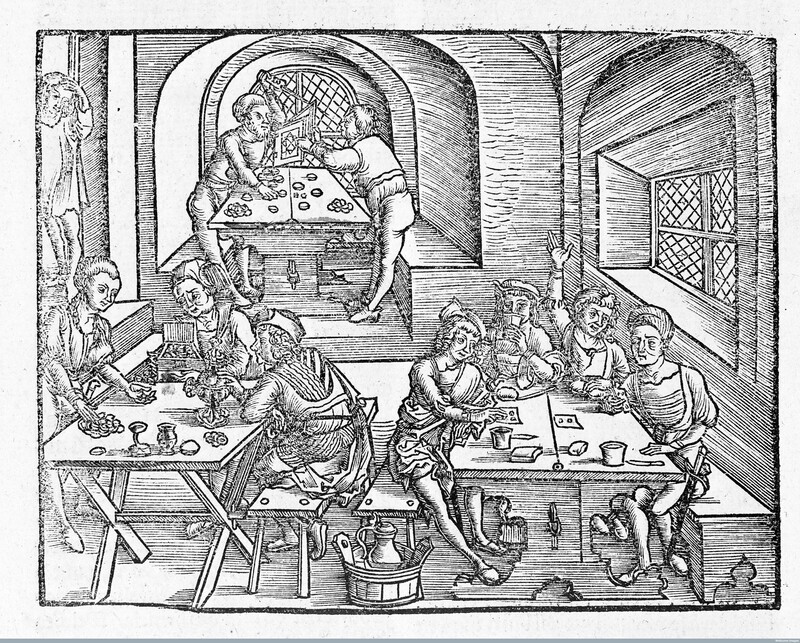 Marsilius Ficinus, Interior of a tavern, villagers playing games and drinking, woodcut, 1505. A medical, health, or life sciences researcher interested in how the arts and humanities can add dimension to your work? A humanities or social sciences scholar whose work considers the meaning and experience of biomedicine, health care, or the life sciences? 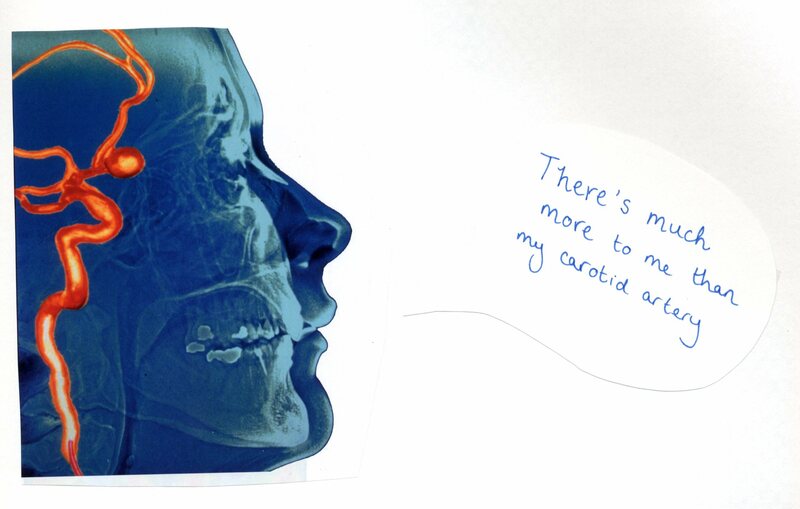 An arts practitioner interested in collaborations around medicine, health, and the life sciences? 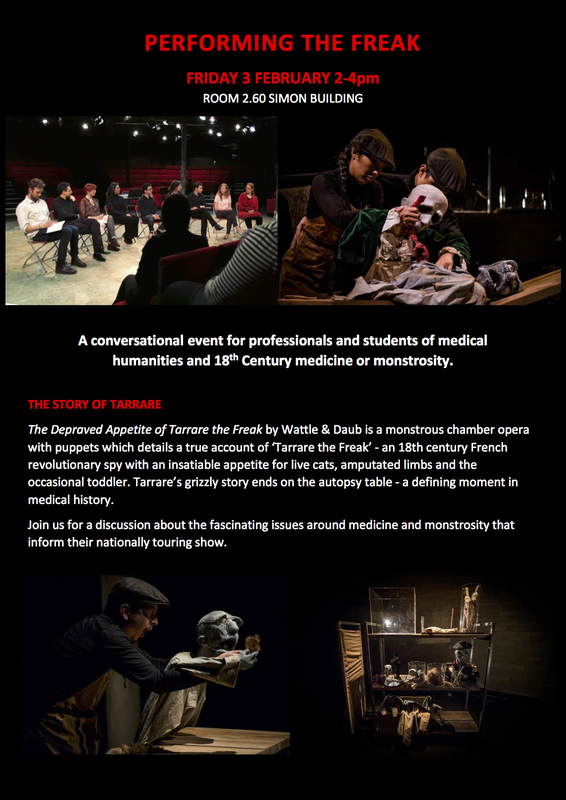 A teacher of healthcare professions or life sciences students, interested in using art, literature and the humanities to enrich learning? If so, JOIN US FOR LUNCH! At this networking event, you’ll meet like-minded people from across the university, learn more about the work others are doing, share your own work, and make connections that could lead to future collaborations. We’ll supply the lunch, with a buffet available from 12:15 pm. Please drop by whenever convenient, and stay as little or as long as your schedule permits. While you’re there, we invite you to give a ‘lift pitch’ – a 90 second summary of your work for a broad audience. You’re welcome to use a visual aid, or one slide on a memory stick. For the latest contribution to our series introducing MedHumLab members, Dr Ana Carden-Coyne, Senior Lecturer in War and Conflict and Co-Director of the Centre for the Cultural History of War, talks about her understanding of medical humanities and her experience of curating the exhibitions The Sensory War at Manchester Art Gallery (2014/15) and Visions of the Front 1916-18 at Whitworth Art Gallery (until 20 November 2016). How does your research relate to the field of medical humanities? 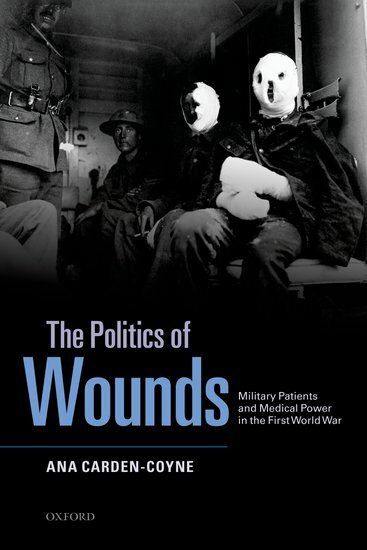 My recent research has been on experiences of pain among the wounded of the First World War, with a particular focus on patient and practitioner encounters. I am interested in how social relations (class and gender) bear out in those interactions of how treatments (both emergency acute and prolonged or chronic) were delivered and received. When I give talks, a lot of people end up discussing their experience in the NHS, so this is very telling about how medical humanities can have an impact on understanding and communicating our feelings about the world we live in today. We can talk about emergency procedures and triage (ambulance services or A & E, which were significantly developed in the context of WW1). We can talk about experimental surgeries and drugs, and ethical issues and patient rights. We can discuss nursing and rehab quality and care; both patients’ expectations and practitioners’ expectations, and the pressures both are often under to rapidly cure or rehabilitate the patient. We can think about the impact on families of chronic pain, when the hospitalisation ends and the family takes over. And we can look at the continuities and changes in wider social attitudes to pain and disability, and how they impact on health and wellbeing, and on medical practice itself. My latest interest is in chronic pain suffered by wounded servicemen and women. And I am working on two projects on occupational therapy in the asylum and in military hospitals, with a major focus on men’s embroidery. I also have a new project on visual art, war and humanitarian disaster, which engages with suffering and medical intervention. How would you define the term ‘medical humanities’ in a few sentences? Medical humanities is an umbrella term that brings together many different arts and humanities disciplines with the medical and social sciences. What appeals to me most, is the focus on humanising medicine and enabling the patient experience through dialogue and communication, and especially through engagement with arts practitioners. What, in your opinion, is the value of interdisciplinary research (and research networks such as MedHumLab)? There is a great deal of inspiring work being done by creative practitioners, academics and artists who approach medicine and medical science in highly useful ways for society and for human benefit. As a historian, curator and heritage scholar, the people who work in this broad field inspire me every day. You have curated the exhibition The Sensory War at Manchester Art Gallery (2014/15) and contributed to other exhibitions in the past. Can you tell us a bit more about your work with objects and visual material? My research fundamentally responds to the cultural phenomena that medicine creates; whether it is diaries and memoirs, surgical technologies and devices such as prosthetics, or infections and rehabilitation treatments. For me, artists’ reactions to war medicine and surgery, and patients’ experiences of military medicine, have been one focus. But I am also interested in humanitarian medicine and its cultural field of representation. And how artists interact with the concerns of patients, cultural imagery, and big questions of human health, crisis and wellbeing. The Sensory War exhibition explored how artists have communicated the impact of modern war on the mind and body, the human sensory experience, and the environment. It considered these themes in relation to each other, or what we might call, synaesthetically. It was a huge show over two floors with 247 artworks, and it took over 3 years and 3 curators to bring it to fruition. One of the sections was called ‘Rupture and Rehabilitation’. We looked at so many inspiring artists, some of whom had acted as theatre orderlies in military casualty hospitals (such as Harold Sandys Williamson’s hauntingly clinical work, The Human Sacrifice of 1918), or were commissioned to document operations during the Second World War, such as a remarkable large scale painting by Alfred Reginald Thomson, Grafting a New Eyelid (1943). Or representations of saline baths used to treat burns patients. 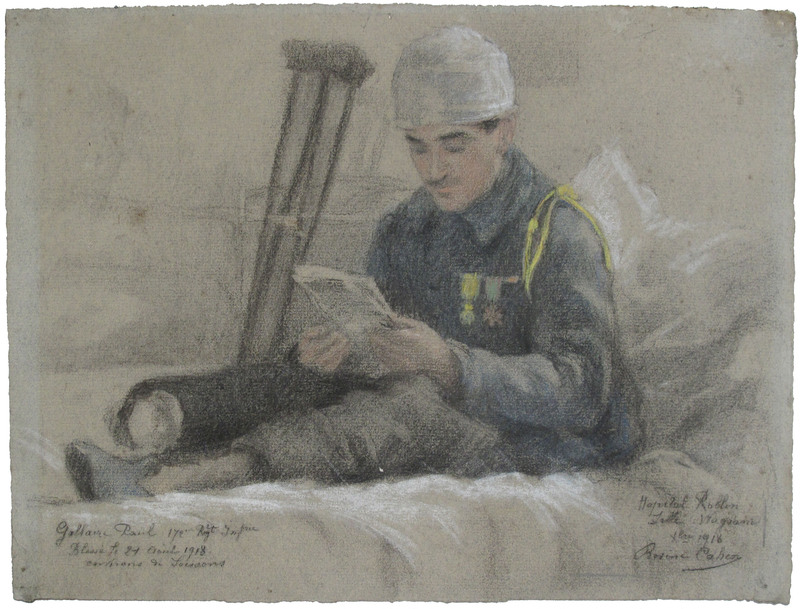 Then there were real discoveries, like the French woman artist Rosine Cahen who went around to the hospitals in France doing very intimate and immediate sketch-portraits of French soldiers recovering from severe wounds, in their beds and some wearing their medals. 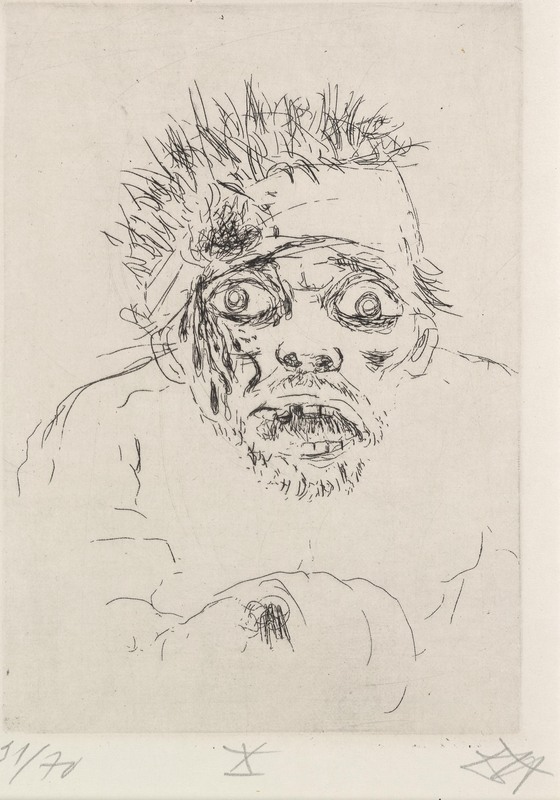 And we also had the extraordinary opportunity to bring to the UK for the first time The Cripples Portfolio (1919) – a set of lithographs by German artist Heinrich Hoerle – in which the daily experiences, losses and dreams of the war disabled are explored. 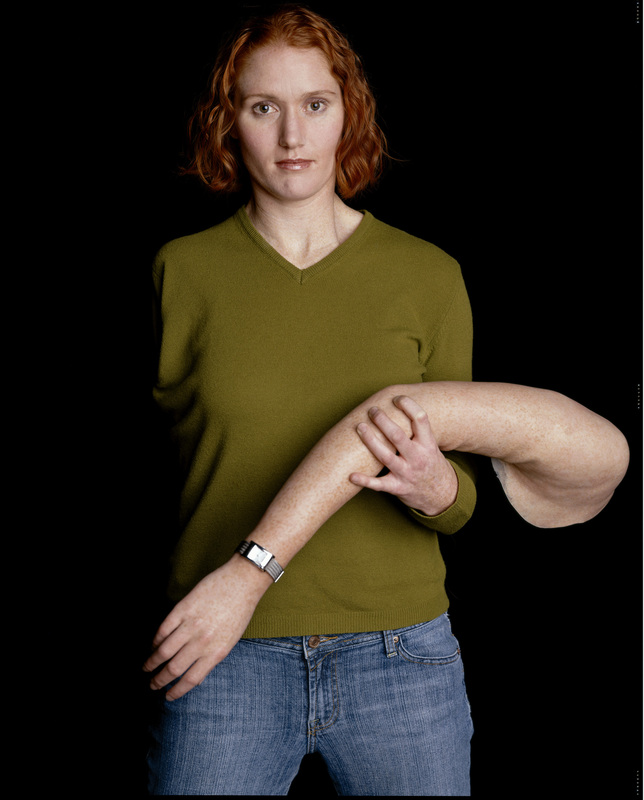 We could compare this with Timothy Greenfield-Sanders’ large-scale glossy portraits of Iraq veterans and their prostheses, and discuss this significant twentieth-century symbol of medical modernity and the ideal of restoration from violence, yet the lingering experience of emotional pain. I have a small exhibition that I co-curated with David Morris at the Whitworth Art Gallery at the moment, Visions of the Front 1916-18, for the Somme centenary. 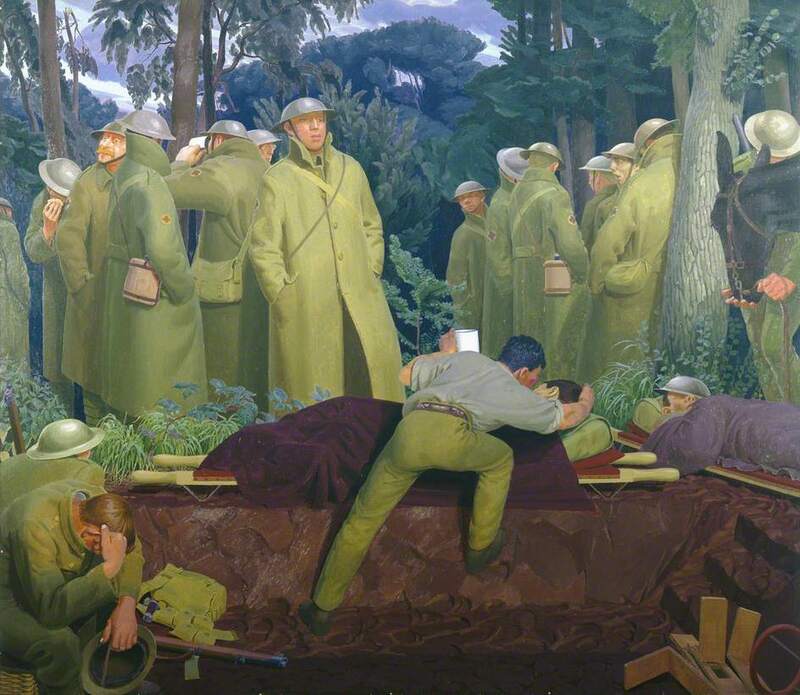 Medical interventions and representations are a major feature of this too, such as Henry Lamb’s painting Advanced Dressing Station on the Struma, 1916 (1921). The scene of a dressing station focuses on the relationship between a wounded man and a stretcher-bearer, who attends him with a cup of water, a great relief that many soldiers wrote about as the comfort given between men. Thirst and cold were understood much later in the war as signs of hemorrhage and shock. The bearer’s hand gently touches the wounded man’s head, providing comfort symbolic of the pietà (Christian iconography of Mary cradling Jesus’ corpse). Indeed, the pietà was often used in war-time humanitarian images of nurses caring for wounded men. But Lamb transforms the theme into an effigy of masculine care and the intimate brotherhood of shared suffering. Placed on the ledge of a shallow trench, the stretcher resembles an altar. In the right hand corner is a Thomas splint used for compound fractures, from which soldiers could die. Pathos is also created by the figure on the left, head in hand, perhaps affected by malaria, a common disease of this front, or perhaps a reference to psychological suffering. The central figure stands over the patient, staring pensively into the distance. Made three years after the end of the war, the composition of this painting symbolises the pain and succour of the entire conflict. Henry Lamb was educated at Manchester Grammar School and studied medicine at the Manchester University Medical School. He left his studies for Paris, to attend the Académie de La Palette, where renowned modernists Jean Metzinger and Henri Le Fauconnier taught. The war compelled Lamb to finish his studies. He received a commission in the Royal Army Medical Corps and was with the Northumbrian Field Ambulance Unit in Salonika from August 1916 to March 1917. And finally, how do you relax and unwind away from the office or seminar room?